For the last ten days we’ve seen a heart-rending example of how personal ecological stress can be. Carrying her dead calf day after day, local orca Tahlequah forces us to reckon with her grief—not just the broad tragedy of climate change and its looming extinctions. It’s a grief we’ll see far too often—in humans and all others—unless the status quo changes quickly and significantly. 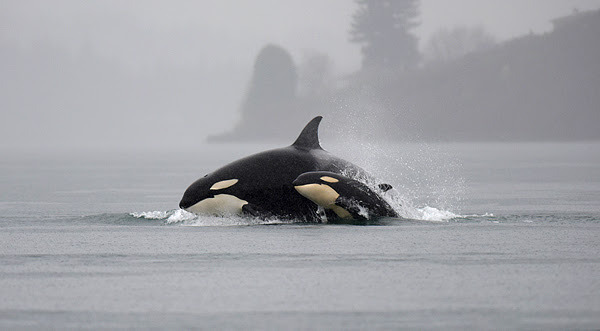 Orcas are on the brink of extinction because of decimated Chinook salmon runs, toxic pollution in the water, and vessel noise that keeps them from finding food. It’s been 4 years since any calves have survived. Please sign this petition urging Governor Inslee to breach the Snake River Dams in order to restore critical chinook salmon habitat. Then sign this one, too. Then send your message to the Governor’s Southern Resident Killer Whale Task Force, which meets in Wenatchee on August 7th. Details here, more about the Task Force here. The annual Free the Snake Flotilla & Recreation Day is September 7th. Details here. Want to see a future with a vibrant Salish Sea? As the lifeblood of our precious bioregion, the Salish Sea needs our protection from pollution, ocean acidification, fish farms, fossil fuels, and climate change. From Vancouver, BC to Hood Canal, WA, come join us for the Salish Sea Day of Action to tell the world and our local decision makers that we demand protection for our sacred sea. While the sea itself may separate us physically, let’s unite in solidarity to face these growing threats. Distributed actions are being planned in communities throughout the region. Find location and event details here. Communities are planning activities and actions focusing on local issues. These actions range from movie nights, work parties, demonstrations and rallies, and more! Share the Salish Sea Day of Action Event Page with your friends all over the region. Volunteer to hold a banner over a freeway or be a part of our rad t-shirt team—contact Ruchi Stair. Pacific Coast Coal Company is still seeking to reopen the John Henry No. 1 coal mine in Black Diamond, just 30 miles outside Seattle. If re-opened, it would be the ONLY active coal mine in Washington state. On Monday, August 6th, the Maple Valley Area Council will host presentations and discussion on the proposed coal mine. The mine owners will be there, as well as government agencies and environmental advocates. Join us there to learn more about the project, and wear red to show opposition to the coal in our county! And if you haven’t already, please comment on the mine’s permit application and tell the Department of Ecology to reject coal mines and other dirty fossil fuel infrastructure in our state! Ecology has received 7,000 comments on the mine so far—let’s keep up the pressure! When Canada purchased the Trans Mountain pipeline for the express purpose of expanding it, the Puget Sound Pipeline spur, which feeds heavy tar sands bitumen to Washington refineries came as part of the package. Since the spur pipeline crosses several waterways, you might be wondering: Tar sands emits toxic gas, sinks like sludge and sticks to the bottom—Is the spill plan sufficient? We’re hearing it’s not. Check out the plan and then use this comment page by August 25th to let the Department of Ecology know that since tar sands stinks, sinks, and sticks, they need a stronger plan than one designed for traditional crude. And keep an eye on social media for a kayak event Saturday, August 18 on the Nooksack River in Whatcom county to raise awareness about a critical river crossing. We’re counting down until the public hearing regarding an in-depth look at lifecycle air emissions for the enormous fracked gas tank in the Port of Tacoma. This agency oversees the last major permit needed for the project, so big public engagement is critical. Please add your comment here… and plan for the hearing on October 30th! The Puyallup Tribal Council recently submitted a formal request to the city of Tacoma, as lead SEPA agency of Puget Sound Energy’s LNG project, to conduct a Supplemental Environmental Impact Statement (SEIS) due to inadequate safety studies. Findings from two separate studies were submitted as evidence. To add your voice to those calling for an SEIS, please sign this petition. Learn about the effects continued fossil fuel use and climate change will have on our community and how you can help stand up for a healthier tomorrow. Courageous dock worker Tracy Wiegman was willing to stand up and tell the truth about the Puget Sound Energy Liquefied “Natural” Gas project. Working with 350 Tacoma, her video was seen over 6,000 times on social media. Now, help us spread her important message further! With your help, Tracy’s video will appear as Google and YouTube ads in the Tacoma area. Take that, PSE greenwashers! Want to learn more about the risks the Tacoma LNG poses to the local community and our climate goals? Contact Mary to schedule a presentation for your school, faith group, organization or business. And check out this inspiring music video for “Stand Today” by Alexandra Blakely. Featuring Dakota Case of the Puyallup Water Warriors with the Tacoma LNG tank as the backdrop, and a message of how you can get involved. Please share! Every two years our state’s largest for-profit utility drafts a 20-year plan. True to form, Puget Sound Energy started the 2019 planning process with foiled attempts to hide from ratepayers and sideline community stakeholders. Now, thanks to your raised voices, PSE has been compelled to hold four public comment events, the first of which is this month. Join us as we demand a 2019 plan that puts us on a path to a carbon-free electric grid by 2038. We’ll update the event page as soon as we have the details. For more about the planning process and how you can participate, visit our PSE Plan page, and for reporting on the technical plan meetings, follow @PSEreporter on Twitter. Oh, and by the way, PSE has scheduled an “executive listening session” for Tuesday, September 11, but they haven’t decided where to hold it. Let’s help them out: Visit this event page to nominate the City of Destiny! Join a global day of action demanding that our local leaders end fossil fuel dependence, transition to 100% renewable energy, and start putting people over profit. These events happen just ahead of the Global Climate Action Summit where mayors, governors, and business leaders will meet in San Francisco to inspire each other to more ambitious and equitable climate goals. Learn more here. What better place for people from all around Western Washington to meet and tell our leaders and elected officials that we expect an end to fossil fuel use, and for communities to come before corporations, than in the shadow of Puget Sound Energy’s proposed 8 million-gallon Liquified “Natural” Gas facility (LNG). Join us for a family friendly march and rally! RVSP and share the event page! This is a collaborative effort and we welcome more groups to get involved—email Stacy for details. Sunday, August 12, Noon till 5:00pm or done! We’ll be painting cloth banners, creating a large deer fence banner, sewing, and possibly batik. All are welcome, no skills needed. RSVP to Lisa. With only 93 days until the midterm election, efforts are ramping up to ensure that Initiative 1631 goes from measure to movement. In July, the campaign turned in the second highest number of signatures for a ballot initiative in Washington’s history. The oil industry may have money, but we have people. And that might just be enough to win. Right now, the campaign needs your help. In the next 93 days they will be knocking on tens of thousands of doors, making phone calls, and sending hundreds of thousands of texts and personal emails to ensure that 1631 passes in November. The goal is to reach hundreds of thousands of votersbetween now and November 7th. Will you help fight for our future? Michael Foster was greeted at the Greyhound station by his community at midnight on August first—joyful people, flowers, and hugs abounding. As Michael spends the rest of August adjusting to life in the city, and among us, we’ve started a (vegan) meal train as a gentle way to welcome him home and spend a little time with him. Email shutitdown.today@gmail.com if you’d like to bring Michael and Sue a vegan dinner. Meanwhile, the Welcome Home Michael screening of The Reluctant Radical at Central Cinema on August 15th is almost sold out. There may be a few tickets left here. With record-breaking temperatures across the globe this July, it’s ever clearer that quick and bold action is necessary, and we expect to know the trial date for Annette, Emily, Ben, and Steve soon; it’ll likely be in November. The Climate Direct Action website is being updated and will shortly feature more about the necessity defense. The mission of the Festival is to help people who live and work in the surrounding regions understand how their actions can help make their environment healthier for people, fish, and wildlife and to introduce people to Native American traditional dances and culture. It features a traditional pow wow, national music, fun zone for kids, traditional salmon bake, zip line, craft and food vendors and much, much more. This year’s headliners are Maddie and Tae on Saturday and Rick Springfield on Sunday. Cost is $20 per car load and $10 between 10:00am and 1:00pm. Portland-based writer and activist Anthony Alvarado, host of the monthly podcast The Magic Hour, speaks about successful actions people’s movements use to defeat tyrants: defend free speech, look after your community, fight racism and misogyny, organize, protest, network, publish. How do child and family detention camps and the Supreme Court’s upholding of the travel ban follow a broader historical arc? Join a conversation, punctuated with arts and creativity, where community leaders respond to recent changes in immigration policy with personal insights and reflections on larger social movements for inclusivity and equality. Highlights will include Indigenous sovereignty, Black Diasporas, and Asian Pacific Islander organizing. Website. Back in May, 350 Seattle co-sponsored the a reading at Elliott Bay Books for Global Warming and the Sweetness of Life: A Tar Sands Tale. Now, we’re hoping you’ll join us to discuss it. For more info check out this description and review. The book is in part a travelogue, as its authors venture out to the Alberta tar sands to learn about the changing lives of those working for and living near the biggest industrial project on the planet. But it’s also a critical inquiry into our conceptions of ecology and climate justice, asking how those ideas might change if we place indigenous sovereignty at their center. Also check out the book club page for updates, author interviews and other little gems. Here’s something to do right now: Write the members of the City Council’s Select Committee on Civic Arenas, and ask why the plans for redeveloping Key Arena include increasing our city’s emissions from transportation? Tell them you want to see our iconic city landmarks truly embody Seattle’s commitment to carbon neutrality, and that genuine support for carbon-free transportation options is a good start. Weekend traffic got you down? Maybe it’s time to put a little energy into helping us transition to a swift, carbon-free and equitable transit system! Join our Transportation Team Monday, August 13th at 4:30 at the Vance Building downtown to talk about campaigns for bus-only lanes and congestion pricing, and brainstorm for our sure-to-be-stellar PARKing Day pop-up park. Email Meg or Andrew for room details. 20,000 dockless bikes and a Basic Bike Network around downtown Seattle, what’s not to like? Well, there’s some devilish details to work through. Want to know more? Bargaining teams from SEIU 925, WFSE 1488, SEIU 1199, and UAW 4121 will be meeting with University of Washington administrators to negotiate transportation benefits for UW workers, and they need our support at a midday rally! More info and RSVP on the event page. What’s loud, smelly and bad for us and the climate? They’re most often powered by two-stroke engines, and research suggests that using one for thirty minutes is equivalent to driving a pick-up truck for 3800 miles. Yes, we’re talking about leaf blowers.Which is why we’re looking at ways to get rid of this pollution-spewing nuisance in our cities. Want to help? Do you care passionately about climate and equity? Are you interested in building a livable, welcoming Seattle even as the world gets hotter and less stable? Help us bring together environmental justice advocates, wonky housing types, labor, renters, and homeowners for At Home in the World: Building a Livable Seattle, a fall forum that will help us all see how we can work together to make our city livelier, greener, and more progressive. Contact Emily if you can help! Apply for 350 Seattle’s Board of Directors – deadline extended to 8/24! 350 Seattle is in the final stages of an exciting restructuring process, designed to distribute power and governance responsibilities to a wider group of people working toward climate justice. We are looking for Board members to serve the organization in a strong administrative role. This not a traditional Board—we have distributed the power to set organizational strategy to our Leadership Team, and our Policy & Endorsements Committee checks requests to support legislation and campaigns for mission-alignment. The ideal candidates would be excited to serve 350 Seattle by providing fiscal oversight and serving in a human resources capacity. More information and application link here. Do you want to support 350 Seattle’s organizing but prefer to work from home, immerse yourself in data, post on social media, or generally do things where you’ll stay out of the limelight? 350 Seattle’s Operations, Fundraising, and Social Media teams are all recruiting new members. Email Valerie if you want to learn more about how to offer your skills in these areas. $13,083 to go! Nancy Nordhoff is matching all donations from new donors and donors who increase their gifts, up to $20,000. We don’t receive the money unless we meet this challenge. This couldn’t come at a better time—we didn’t get a couple grants we thought we had a good chance of receiving. Help us fill this gap, receive the matching gift, and invest in grassroots climate action. To donate online, click here. Or mail in a check: 350 Seattle, 1919 E Prospect St, Seattle WA 98112 (please write: “for match” in the memo). Or donate stock: all the details here. We’re getting Intertwined again, Friday, November 16—Save the date! The Feds killed it in 2016 because no one wanted it. But now… it’s back, the zombie fracked gas pipeline that wants to ruin 400 waterways and stomp across 200 private properties. Whip out your email finger and send off a quick one here. If approved, the Pacific Connector Pipeline and Jordan Cove LNG terminal would be Oregon’s largest source of greenhouse gas emissions. More on this travesty here.